, an historical and portrait painter, was born at Troyes, in Champagne, in 1610. He was the disciple of Vouet, but quitted his school at an early period of his life, and went to Rome, anxious to see and study the works of Raphael, Michael Angelo, and the Caracci. He there lived with Du Fresnoy, and they studied together the noble works of art which that city presented to them; they also travelled together to Florence and Venice, that they might leave no source of improvement unsought which the extraordinary talents of their great predecessors had prepared and left for their study and imitation. Mignard’s residence at Rome, which he prolonged for twenty- two years, and the style he acquired of composition and drawing by the imitation of the Roman masters, together, obtained for him the appeHation of the Roman; but to judge candidly, one would imagine that the former was the principal cause of that denomination; for his style of design savours too much of the flutter of the French school, instead of the chaste simplicity of Raphael and the best of the Romans. He enjoyed, however, a full share of favour and fortune during his life. 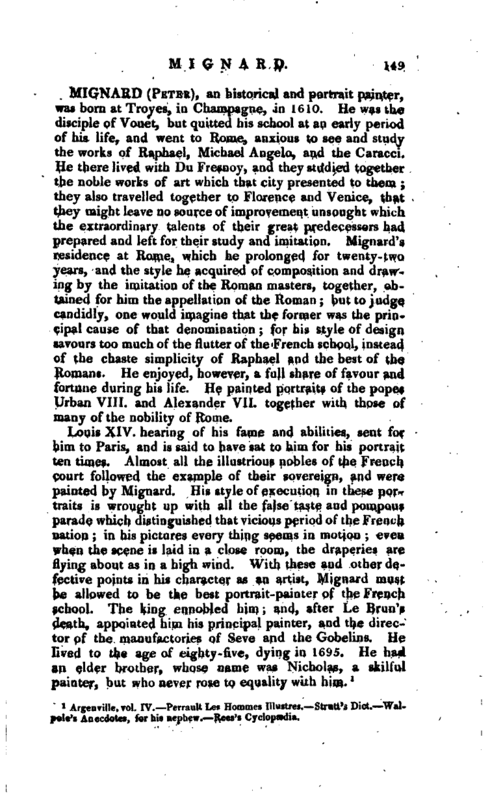 He painted portraits of the popes Urban VIII. and Alexander VII. together with those of many of the nobility of Rome. Argenville, vol. IV. Perrault Les Hommes Illastres, —Strutt’s Dict. 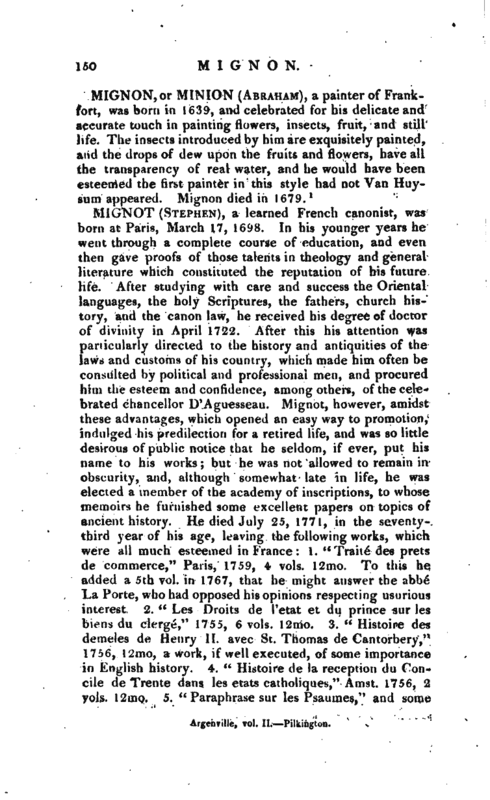 Waipole’s Anecdotes, for his nephew, Rees’s Cyclopædia.